Mizuma Action is pleased to present “Never Ever In My Life”, YAMADA Ikuyo’s first solo exhibition in the gallery. Yamada was born in 1983 and after receiving a master’s degree in oil painting from Musashino Art University in 2008, she had her very first solo exhibition “Excuse” at Takahashi Collection in 2009. 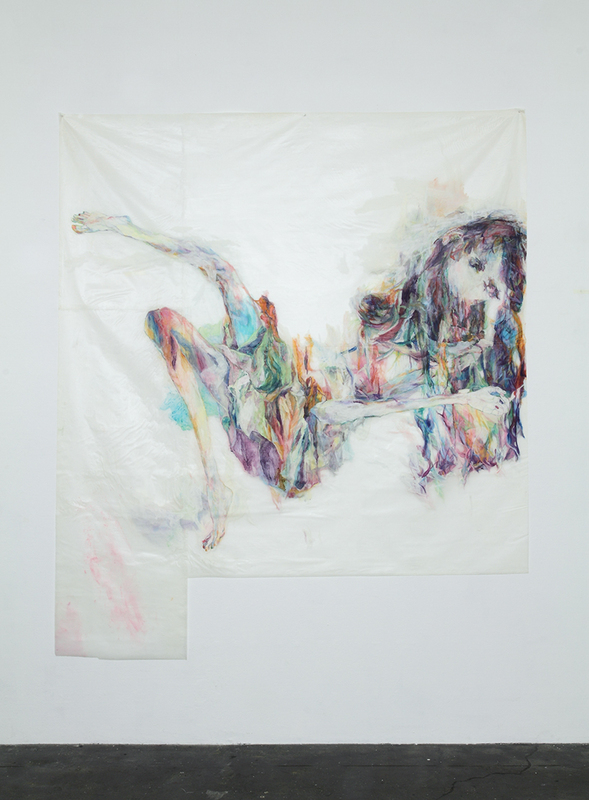 Yamada draws intense figure paintings with oil pastel on tracing paper. For this exhibition, she will also reveal an entirely self-made video artwork as well as pictures giving the impression of leaking words. Yamada says “pictures are expressing things that cannot be put into words so it is hard to explain.” For certain it is not an easy task to rightfully describe the appeal of her work, still we can say she is a gifted, sensitive painter who let her instinct leads her to ways of metamorphosing oil pastels and tracing paper into forms and colors. The utterly casual way in which those delicate paintings are displayed reflects the depth and fugacity mixed in the artist’s interior aspect. While exhibiting her works, Yamada still grapple with the contradiction of not willing to be seen, she denies her relationship to the objective world, expressing through her art the intense conflict that roars within her shell. This kind of motive may seem very personal at first, but behind it there are words like “hikikomori” (voluntary withdrawal from society) and “muen” (isolation) representative of the Japanese contemporary society. What impacts us the most in Yamada’s works may well be that they symbolize the hidden negative aspect of developed countries by totally exposing our weaknesses and apprehensions. The one hour-long video Ippodemomaenishine (“Die Before I Do”) was entirely shot and played by the artist herself. Its brutal title contrasts with the armless scenes reminding of idol promotion videos, puzzling the viewer. As she keeps on smiling all on her own, this video differs from the idols’ in its complete disconnection with the law of supply and demand. The artist’s desire to be loved as well as her works contradicts with her reluctance to be seen, this opposition is at the basis of all Yamada’s paintings, videos and words. We invite you to discover the works produced by Yamada’s unique sensibility through the vicissitudes of our age.